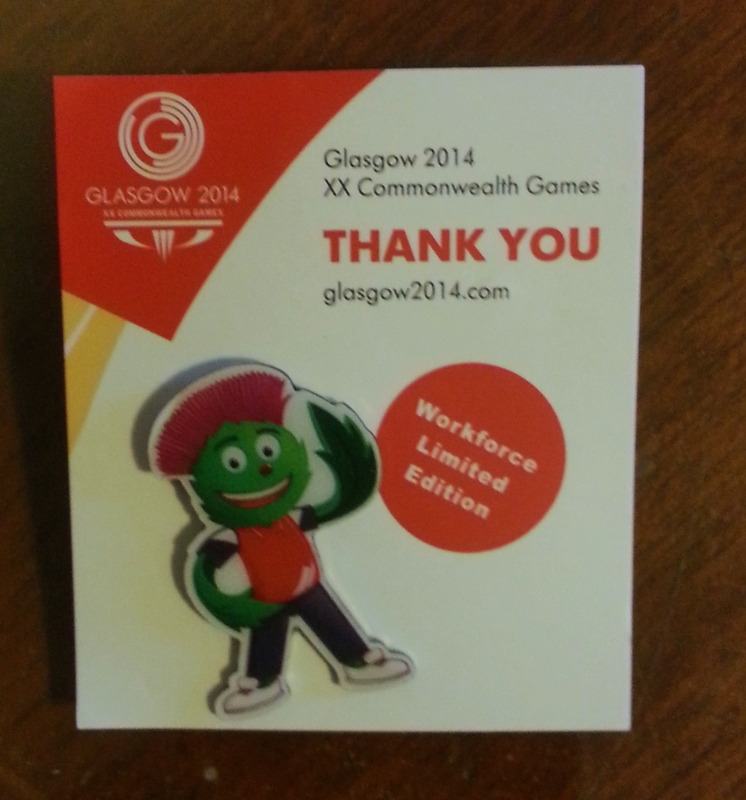 Some months ago I saw a thread on social media about pins for the Commonwealth Games. There were a great many participants in the discussion, about design and cost, for the production of one especially for the Clydesider Volunteers who would be working with the country teams in the Village. I didn’t think much more about it, other than to wonder at the number of people who appeared to be interested, and to recall that my niece, a Gamesmaker at London 2012 had collected a couple of badges as thank you gifts. It’s only over the last couple of days that I have understood the depth of my naivety. Pin collecting is a Big Deal at the Games. I might go as far as to suggest that some people have got a little carried away and ever do slightly obsessive about it. Some of the teams have given their athletes and officials a few badges to swap with new friends that they make during the time they are in Glasgow. It makes sense, the sharing of a little memento of meeting someone from a far away country, encouraging the competitors to chat about swapping, something to start a conversation, something to share. It’s easy to see the genesis of the idea, a small inexpensive item and a lot of fun. What it seems to have turned into is astonishing. Adults are walking around the village clanking from all the enamelled metal they have hung around their necks; people are walking into the team office asking for pins, sometimes offering a swap, other times just asking for a gift. Some are honest, saying they are trying to get a complete collection for themselves, others throw in stories about children, their own, or some other particularly deserving case. The badges have become a sort of currency, offered and exchanged for favours, like tobacco in American movies about prisons. My position is simple: our team doesn’t have any, no matter how many hard luck stories you have to tell or how many times you ask. I’ve witnessed this absence putting our athletes at a slight social disadvantage, when in the parade line up for the Opening Ceremony they didn’t have anything to swap with other teams, other than their lovely smiles and quick witted back chat. So any badges I might have, I’m sharing with them. Some of the people I was working with at the athletes village were just rather rudely asking for badges from the athletes. Myself, I got my mini-collection as “thank yous” towards the end of the Games! It’s nice to be important, but it’s more important to be nice! Thanks for visiting and taking the time to leave a comment. The whole thing around the badge collection became rather peculiar, I thought. As you say, people barged in, not always politely asking for badges. It was easy for our team to say no, as we didn’t have any. After a few days I even took off the couple I had been given by other people because I didn’t want to be part of the game. You’re right about the importance of niceness.